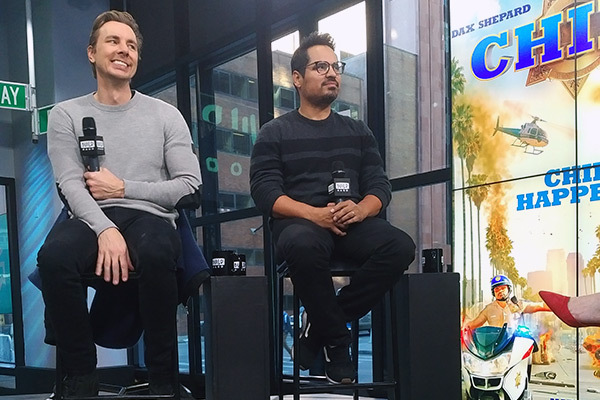 Dax Shepard recently revealed during an interview with my friend Leigh Blickley for AOL’s BUILD Series that he pitched Michael Peña to be his co-star in the movie “CHIPS” without even meeting, let alone consulting the actor first. That’s certainly a break from the Hollywood-norm; so were the comments Shepard made about Los Angeles while chatting in NoHo. “No ma’am,” Shepard responded to Blickley when she asked if the two had met prior to filming the comedy. “But we did have a very romantic, blind date breakfast at Café 101 in Hollywood, if you’re ever there. I mean, it’s not that I hate Hollywood. It’s just that I’d rather have four seasons, more efficient public transportation, honest people, a faster pace, my bodega that’s open 24 hours on Seamless and the Yankees. OK fine Dax, maybe I hate Hollywood too. But I appreciate your cognizance. There were a lot of “firsts” on my latest trip to Los Angeles: my first time running 14 miles while on the west coast, my first time leaving an item behind at the dry cleaners, my first time covering an award show weekend without attending said award show and my first time flying back and having to travel directly from the airport to the radio station so I could immediately hop on the air. This and more explains why for the first time, I’m just jotting down stories from the jaunt to cover GRAMMYs weekend… about two weeks after the fact. Working out is one pre-trip routine; another is visiting H&M Times Square the night before I fly out. In the past, this would be a necessity to pick up a few clothing items last-second. Recently it’s become more of a customary trip because I actually plan ahead and shop for most of my clothes weeks before so I can purchase online. Regardless, I found a few shirts and made my way uptown. I settled in to my apartment with a coffee, caught up on work and packed. My flight was at 7 am out of JFK so I pulled an all-nighter and slept on the plane. Having the day in Los Angeles ahead of work obligations was fantastic. Through Amazon Prime I ordered a tripod, almond milk and a case of water for my room. At the Ralph’s supermarket nearby our downtown hotel I picked up produce, a few vegan breakfast items, snacks and hummus. I also made time to drop off the dry cleaning that I would eventually forget to pick up. After unpacking my suitcase and putting away my groceries, I fit in a nice 5 mile run, then showered and prepared for our GRAMMY broadcast orientation. It took place on Thursday night in the hotel, complete with beer, wine and passed hors d’oeuvres. The night continued with a few colleagues at a posh sushi joint downtown and ended with me passing out instead of meeting up with friends (remember – I pulled an all-nighter and was still on east coast time). Friday started relatively normal: woke-up on time, fit in a quick jog, grabbed breakfast, prepped and changed. I walked over to Staples Center around 11:30 am for our noon broadcast; in addition to setting-up our space for the weekend I had to meet with network execs and representatives from Twix. For the two-day event myself and TV host Rocsi Diaz would serve as brand ambassadors on site for the candy, interviewing artists about both their music and Twix. Of course this was in addition to my responsibilities with my four radio stations. Perhaps the most poignant from Friday that didn’t see the light of day: the chat Rocsi and I had with GRAMMY nominee Charlie Puth. I asked Charlie who he would thank if “See You Again” scored one of the three awards it was up for. He responded with his mom, Wiz Khalifa and Paul Walker. Rocsi asked a great follow-up about Paul and Charlie revealed that he never met the late actor, but through the song formed a strong bond with “Furious 7” star Vin Diesel. The two often swap stories regarding Walker and the person who Puth originally wrote the song about and Charlie told us the similarities are striking. The broadcast is four hours of insanity: handlers moving artists in and around your interview area, pre-taping for radio stations, taping for Twix, posing for photos, brokering scheduling deals to snag time with celebrities, the interviews themselves and then a lot of hand-shaking. I usually wash my hands at least twice during the time I’m there. The nice thing is that we always wrap with what one executive in our company termed “mandatory fun” – a live artist performance that’s catered with beer, wine and food. On Friday we were treated to a set from Mike Posner. Typically this is the point where I would retire to my room for the night and edit photos, video and audio until I couldn’t see straight. Instead, I uploaded a photo slide show and a few interviews and then had to get ready for Friday night’s festivities: Rooftop Live at Perch downtown. The evening included music by Audien and a performance from the Joe Jonas-fronted DNCE. By the way, DNCE is fantastic live. This is definitely where my weekend turned: I was out late, still on east coast time and my itinerary for the weekend was not letting up. I slept-in Saturday and instead of going for a run, used my morning to continue uploading content from Friday. Then, it was off to Staples Center for round two. The big differences between Friday and Saturday are that on Saturday, I’m not on-deadline with four radio stations and many more artists come by. As far as interviews, it was nice to chat for the first time with Nick Fradiani, BØRNS and the lovely Hailee Steinfeld. “Mandatory fun” included a rousing performance from Nathan Sykes. I taped a few more things for the weekend radio shows and then packed up. Again, usually Saturday night would be spent editing non-stop. Instead, I edited quite a bit, grabbed that 3 mile run I skipped earlier and got ready for a night-out. A friend of mine from Niagara Falls, Allyson DeMunda, was performing at the legendary Comedy Cellar in West Hollywood. I had never been to the venue and I wanted to support her, so I trekked out to WeHo for the evening. She was fantastic, as were some of the others, including “America’s Got Talent” season eight runner-up Taylor Williamson. By the time the show wrapped and I found an Uber, Los Angeles already had its last call, so it was back to my room to upload more content and get a good night’s rest. The elevators in our hotel were out-of-order Sunday, a lovely surprise to wake-up to. Naturally, I was on the top floor. I packed a bag with gym clothes, walked down the stairwell, and checked it at the lobby. Then I headed back to Hollywood for brunch with a buddy of mine – we also watched Syracuse beat-up on Boston College. He drove me back downtown where I picked up that bag and worked out. Yes, I still had editing to do and was able to complete a bit more work before cleaning up for Sunday evening’s festivities. First stop: Capitol Records iconic Studio A. Frank Sinatra, John Mayer, Daft Punk… so many legendary artists and songs recorded in the room I stood in. To honor the “Chairman of the Board,” I partook in a drink of Jack Daniels, his favorite. By far this was the coolest moment of the trip. The event was held in the studio, dimly lit with a full bar and light fare. Every song they played in the background was recorded in Studio A. Yes, even “Let It Go” made the playlist. The event also included a question-and-answer between our SVP/Partnerships Tommy Page and the legendary songwriter Diane Warren, plus a performance by Troye Sivan. Our crew made a quick pit-stop at The W before heading to the Nielsen Pre-GRAMMY Bash, which was held at Hyde and featured entertainment from the Preservation Jazz Band and the GRAMMY-nominated Leon Bridges. The party was spectacular; full bar, sushi, a couple of carving stations and most importantly a lot of really great people from our industry. The Sunday night-cap included a trip to In-N-Out and I vow to never order a burger “protein style” again. I ended up taking a quick nap before an early flight back home. Normally I sleep on the plane, but instead I found myself editing copious amounts of video and then being stuck in a holding pattern for over an hour due to the weather at JFK. When we finally landed, it took us a half-hour to taxi yet somehow I still made it (barely) for my show that night. Naturally, it took my body much longer than normal to recover from my latest west coast trip. And I still haven’t figured out how I’m getting my jeans back.